100 events that made history is jam-packed with the most important events that changed the course of history. 100 + recipes that you&apos;ll love to cook and eat!. When Peter an eight year old London boy with neglectful parents and a distant nanny. That Cat In the Hat learn about cats-wild and domestic-in this feline-focused Cat in the Hat&apos;s Learning Library book. Cat Tales present, 23 stories of compassion, ingenuity, and bravery that are sure to entertain, tug at the heartstrings. The warrior Clans are facing an enemy more dangerous than they have ever known. Darktail and his band of rogues have seized ShadowClan&apos;s territory. "Like a bolt from the blue, Jack&apos;s little sister Maddy is gone-- carried into another realm by an ogre. When Jack and Lilly follow Maddy&apos;s captor through the portal, they are ready for anything... except what they find waiting for them in the floating crossroads between worlds. Even the power of their magic plants may not be enough to get them back to earth alive"--Back cover. "A picture book biography of Dr. William Key, a former slave and self-trained veterinarian who taught his horse, Jim, to read and write and who together with Jim became one of the most famous traveling performance acts around the turn of the twentieth century. Includes afterword and author&apos;s sources"--Provided by publisher. "Herk, a lovable Nnewt, longs for stronger legs, something his mother and father wish they could give him. When his quaint village is attacked by the reptile Lizzarks, he&apos;s forced to flee his home and leave behind the only life he&apos;s ever known. Now, all alone and on the run, Herk navigates a dangerous world filled with strange creatures and mysterious wonders, where friends are few and an evil lord is in hot pursuit"--Provided by publisher. After her older brother starts acting strangely, Sunny Lewin is shipped off to Florida to spend the summer with her grandfather. She makes a friend her age and tries to enjoy her stay but, other than Buzz, everyone is really old. Besides, Sunny just knows her parents sent her away because she somehow made her brother the way he is. She just wants things to go back to how they were before. Ten-year-old Leo loves being a newsboy in San Francisco--but early one spring morning in 1906 Leo&apos;s world is shaken, when he finds himself stranded in the middle of San Francisco as it crumbles and burns to the ground. 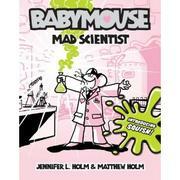 Babymouse discovers Squish, a new species of amoeba, while working on a school science fair project.